And today I found a new place online to play with words. 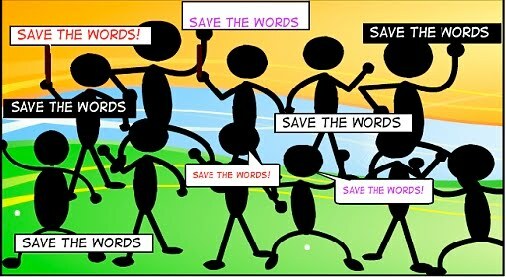 It's called Save the Words. Sadly, hundreds of words are dropped from the English language each year. How long since you used pamphagous or magistricide in a chat? The site encourages us to find room for these older but interesting words in our conversation and other communication. It even has suggestions for ways to bring words back into fashion, although I must admit I eschew skywriting as a possible method! Best of all, the home page brings us a wonderful collage of words, all of which are crying out to be chosen - "me, pick me!" You can move a window over these words and scroll across your screen. When you click on a word, it gives you its definition. You can also sign up to get a word a day, and even have a word printed on a t-shirt if you live in Malaysia or Singapore. I love that site! I try to use as many obsolete words as I can in my blog titles at motherisnotconcerned.blogspot.com. Holly, what a brilliant way to use Save the Words! I've just had fun at http://motherisnotconcerned.blogspot.com/ working out what you mean. Great blog! Oh, this is a fabulous idea! I love saving old words from extinction. :-) I'm guessing pullarian has something to do with chickens. (My guess is due to knowing 'poulet' is chicken in French, and you are, well, THE BOOK CHOOK ... so that's a sort of hint. ) So, is it 'chook-like'?! That is pretty bloomin' cool - I am heading over there to adopt a word! Definitely! I'm on it! You got it! BUT, I love your pull the door definition, too. I would love to play dictionary with you - do you know it? We play with notepads and a dictionary, but I think the board game they copied from it is called Balderdash. Basically, you try to fool people with creative definitions. I wonder if we could play it here? Hmmm ... think I can feel another blog post coming on! Becca, I suspect you might be another word lover - welcome to the club! What a neat, neat idea to adopt a word and save it. The beautiful thing about a word is all the meaning and emotions wrapped around that tiny piece of a complete thought. Looking forward to finding and adopting a word of my own. I'm so glad you like it too, Kelly!